In these times of financial hardship and uncertainty one tends to feel down in the dumps too often. From trying to find a full time job, to finding creative ways of paying for essentials it's always hard to keep a chin up and a smile on your face. But, after many months of struggle I've found that the only way one can go from here is up. It's these hard times that help me realize what I have and be thankful for the people that surround me. As the quote above says, happiness comes from appreciating what you do have and not from getting something you don't. Well, this weekend marks three months of me turning 30 and starting my blog. This is a check-up of sorts of how I've been doing and what I've accomplished, and let me tell you, I'm proud! Not only have I kept up with my blog on a daily basis (which I so enjoy doing), but I've launched my LizzyB Loves website as well, something I had been attempting to do for years. I've met many great people through this blog and I've been inspired to create many new things. So, in retrospect, these hard times have been the impetus for me, and many people, to do what I really want and accomplish all I want in life. I am able to do what I've been wanting to do for a while now, which is sit in a coffee shop and work at my leisure (and be paid for it!). Sure, it's not the end of bad times, but it's the start of many good times to come, and this video was of great inspiration! 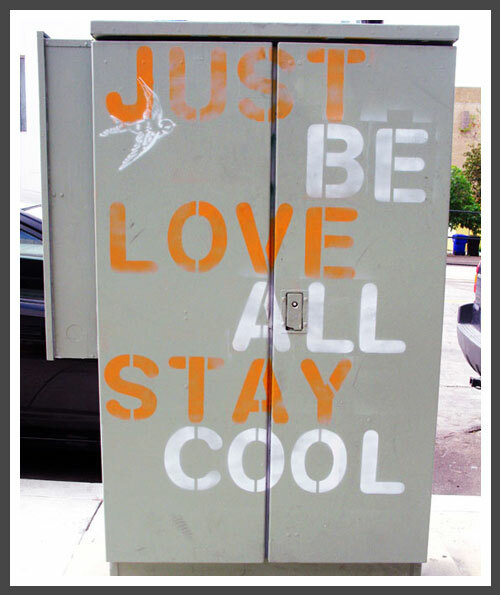 Just Be, Love All, Stay Cool. Happy Weekend.